1. Central Park. New York City. “People dancing, people laughing … a real celebration.” Robert Lamm of the band Chicago wrote these lines in “Saturday in the Park” after spending a summer day in Central Park. They still ring true today. We walk in the park on nearly every visit to New York, and we’re always discovering new corners. Ursula and Virgil’s finds on our last trip included “Strawberry Fields,” a tiny garden across from the Dakota apartment building memorializing John Lennon of The Beatles, and the small pine grove called The Pinetum. Signs and maps at reasonable intervals make it easy to navigate around the 843-acre park. 2. High Line. New York City. Neighborhood activism, a great idea, and a sturdy old rail viaduct came together to create New York’s newest trail, and surely one of its most remarkable. The “elevated park,” the second of its kind in the world, opened during the summer of 2009. A set of stairs above Gansevoort and Washington streets serves as the trailhead to the green walkway, which extends 0.8 miles north along the western edge of Greenwich Village, through the Chelsea Market arcade. 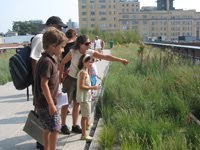 Check the High Line website for such activities as last-Wednesday-of-the-month scavenger hunts for children 5 and up. 3. West Pond Loop. Broad Channel, New York. Jamaica Bay Wildlife Refuge, the only wildlife refuge in the National Park system, is a popular birding site in the middle of the New York Harbor. The West Pond Loop offers views of “big birds” — planes, that is — as well as some of the 325 “real” birds, such as osprey, swans, herons, and egrets, that can been seen in the salt marshes. The full loop around the pond is 1.8 miles. Accessible by public transportation. 4. New York Botanical Garden — Native Forest. Bronx, New York. 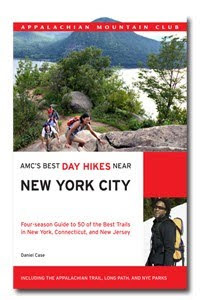 This hike has an entrance fee, but once you’ve paid for your visit to the New York Botanical Garden, you’ll have the opportunity to spend time in 50 acres of forest that, as guidebook author Case says, “haven’t been cleared since before the Dutch traded beads with the American Indians.” And, as you might expect from the largest botanical garden in any city in the world, there’s much more to view, besides. Not open on Mondays. 5. Massapequa Preserve. Massapequa, New York. F. Scott Fitzgerald famously imagined in the closing paragraphs of The Great Gatsby that the lush forests of Long Island must have looked like “a fresh, green breast of the new world” to early settlers. That forested landscape had largely disappeared in the 19th century, when Walt Whitman walked “the long brown path before me leading wherever I choose” as a child growing up on Long Island. But there are still pockets of undeveloped green space amid the suburban sprawl. The Massapequa Preserve on the South Shore of Long Island is the southernmost section of the Nassau-Suffolk Greenbelt, a 20-mile trail that ends at Cold Spring Harbor State Park at its northern end. The 2-mile out-and-back trail through the Preserve crosses over streams and through woods, and travels along the shores of Massapequa Lake. Accessible from the Long Island Rail Road’s Babylon Branch. Photo from Friends of the High Line.